72 hours prior to arrival, 50% of booking charges will be chargeable. 48 hours prior to arrival, 100% of booking charges will be chargeable. Premise is not wheel-chair friendly. Choose CUBE Boutique Capsule Hotel at Chinatown for a not-to-be-missed capsule hotel experience you can only find in Singapore. We combine favourite hotel features and amenities, the friendly atmosphere of a connected community, and a capsule sleep experience that is bucket-list worthy-- all at surprisingly wallet-friendly rates. Be the best you you can be while in Singapore: Enjoy great sleep, spot-on advice from our hotel staff on what to do, see and eat, and the ideal mix of complimentary amenities that lets you spend your travel dollars where it matters- on creating amazing travel memories. Welcome to CUBE! Conveniently located in the heart of Chinatown, our hotel provides easy access to Singapore’s key cultural and historic tourist attractions, great restaurants of all kinds (including the famous “$2 1-Michelin Star chicken rice restaurant” on the ground floor of our hotel), and is just a short ride away by MRT from popular destinations such as Clarke Quay, Gardens by the Bay, and Sentosa. Just a few minutes’ walk from Chinatown MRT station- you can really step out of our doors, straight into the action. 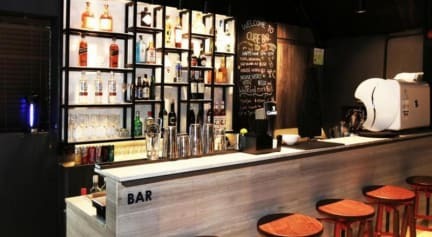 When you’re done exploring, enjoy inventive cocktails, fine wines, craft beers and unique coffee creations at our on-site CUBE Bar. Its relaxed communal vibe makes it the perfect place to meet new friends. Want to have a deep and refreshing night’s sleep? CUBE Hotels feature a collection of comfortable capsules in shared or private rooms, each a cosy cocoon hidden from the outside world. Each capsule is designed with meticulous attention to detail. Our mattresses are super thick, and the linens are snuggly soft and plush. Not only are there several vital features available right inside your capsule, such as in-built universal plugs, and USB charger ports, but we’ve also added lights that dim, soundproofing, and air vents inside to create the ideal temperature. Come to CUBE for a sleep experience like none other. SINGLE CAPSULE: Each made-to-measure capsule comfortably accommodates one person, and there are handy, secure nooks located beneath each platform-style bed to store your belongings in the shared rooms. QUEEN CAPSULE: Larger queen capsules are designed to sleep two people side by side. These capsules are in shared room accommodations or can be booked in a private room. FEMALE-ONLY CAPSULE: Your capsule will be located in a shared room with females only. PRIVATE CAPSULE: Book a private capsule to ensure total seclusion from the outside world. Our private capsule rooms can accommodate two or six people. Check out before 12:00 (noon). Full payment is to be made upon check in. We accept cash (Singapore dollars) and credit card (multi currencies through Visa/Master/American Express/JCB Credit and Debit Card and surcharges will be applicable). Age Restriction: The minimum age to check in is 18 years. •Hotel cleaning starts from 12pm to 3pm. •Valid photo identification, such as passport or Identification card is required to be presented upon check in. •The Single bed is suited for one person only, while the Double beds are suited for two persons. If there is an additional person travelling, he or she has to make a reservation for another bed. •If you would like to extend your stay, please notify us one day in advance. •Full payment is needed to be made upon booking. We accept multi currencies through Visa/Master/American Express/JCB Credit/PayPal and Debit Card and surcharges will be applicable. Alternatively, Payment via cash is also permitted and it should be in SGD currency only. •Minimum age for children is 12 years old. No sharing is allowed for a single bed booking. •Smoking is not permitted within the premises of Cube Boutique Capsule Hotel. An individual who is caught smoking in a prohibited place may be allowed to compound his offence for $200 in lieu of attending Court. If convicted in Court, the offender may be liable to a fine of up to $1,000 - by NEA. •The comfort, safety and security of our guests are of paramount importance to us at Cube. Guests are expected to respect other guests as well as staff, local residents and property. •Guests will be penalize for any damages made to the property or equipment. •Guests are expected to strictly follow the beds assigned to them in order not to cause inconvenience to other arriving guest. •Drinking of alcohol is permitted at lounge area only. No outside alcohol drinks are allowed in the property. •Any guest who appears to be drunk will not be served any alcohol or admitted to the property. Any guest who is considered to be acting in a severely drunken manner will be asked to leave the property, with no refund of balance stay. •A fine of minimum $500 will be imposed if any damage occur from drunk guest (this includes physical damages to property, vomiting within property & etc). Pay attention at the number of beds in a single ROOM! In this hostel, such as in "COO Boutique Hostel", the concept of ROOM is quite strange and it's confused with the box or bed or capsule.